The end of 2015 has come and gone and we’re circling back around into a new year. Reflecting on last year, I saw various “Best of 2015” lists. What were the best movies, music and photos? Most compelling stories? Loveliest moments? Scariest events? What have we learned? What have we struggled with that needs more time to figure out? On a personal level, I’ve felt a strong urge to sort through things, clean, rearrange, recycle what I no longer need, find new homes for reusable items, and discard what’s too worn to be useful. Some of this work is a sort of ending. And colder winter weather also keeps me inside more so it just feels like a great time to do these tasks. Closing out an old year, while taking time with family and friends, allowed me to reflect on what is important. I’ve not been a big fan of New Year resolutions, but having a re-start date can be useful to focus on self improvements. This informative and humorous article by Elahe Izadi in The Washington Post points out why the new year starts on Jan. 1, noting it is a terrible time for renewal. For me, though, the gradually increasing amount of daylight after the Winter Solstice on December 21st brings feelings of new growth. (Getting gardening seed catalogs in the mail help that along, too.) But I know the first of the year is not the only time for new growth. With things I no longer need cleared out, I now have a blank space (or a blank canvas) to explore, create and fill. But what will I do and create? Something brings me back around to the words of the late Joseph Campbell, the famous American scholar of world mythology. His answer when asked this kind of question was “to follow your bliss.” The Painter’s Keys Art Quotes has this great list of Joseph Campbell quotes. I hope you enjoy them! So I’m trying to stay aware and recognize what brings me happiness and joy so I can fill my space with more of that. Creating art and exploring my and others’ dream realms are a few of the blissful, energizing paths I am on. 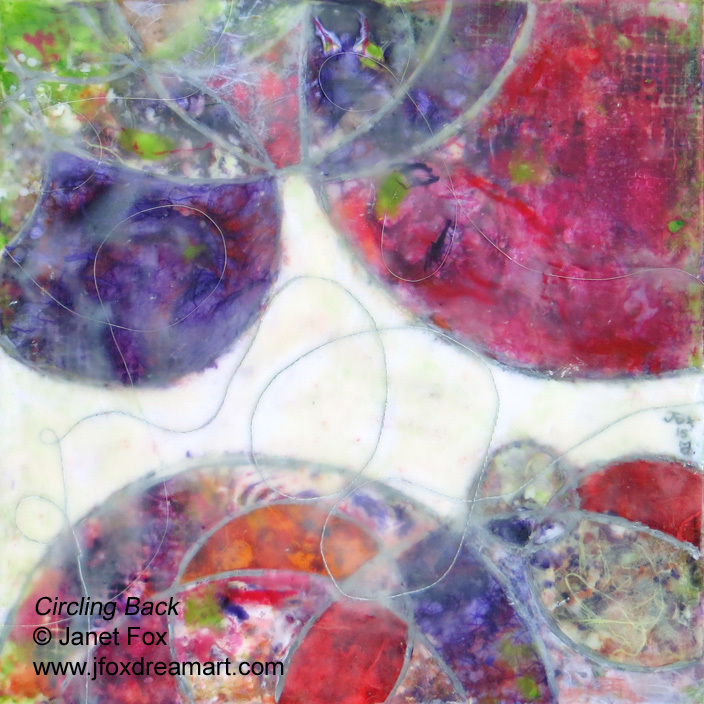 In this contemporary encaustic painting, I created roundish shapes and paths. Layering papers and colors reminded me of how I often repeat similar things, although no two times are identical. I chose a thin silver cord for skipping around, for a light feeling. So here we go again, but with another year of experience under our collective belt. What changes need to be made… and can we muster the courage and energy to make them? What blissful paths are you following?